Knights of Creativity Spirit & Ale: Are All Things Bigger in Texas? I admit it – I LOVE FOOTBALL! And though I’m trying to spend more time in creative endeavors (cooking, woodworking, hiking…), I I LOVE FOOTBALL! Real football – the American football. And I also love watching games – college or NFL -- on TV. This past Sunday night was no exception as Sir William of Keglers and I watched the New York Giants vs. the Dallas Cowboys. Even though this is only week two of the NFL season, this was one special night: This was the Cowboy’s home opener in their new $1.2 billion (that’s billion with a B) stadium. 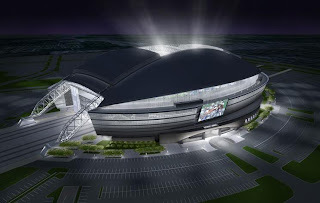 Cowboys owner Jerry Jones was quoted as saying: "If you're going to do it, you might as well do it bigger.” It was his vision to build the greatest stadium in the world – and according to those who have seen this behemoth in person, he just might have pulled it off. Jones and his family evidently flew around the world looking for inspiration for the stadium, including London's Wembley Stadium. The largest HD screens in the world – the main screen is 50 feet high and 180 feel long. 286 concession stands, eight clubs, 23 bars, and over 1,600 toilets. Works of art from renowned artists throughout. The players enter the field through a bar: After leaving the locker room, the players make their way to the field while surrounded by hundreds of screaming fans. And the the nighttime views from outside the stadium are stunning. There is a half a million square feet of glass and limestone. The glass wall at the end is inverted at a 14-degree angle that allows thousands of lights to create a shimmering effect. 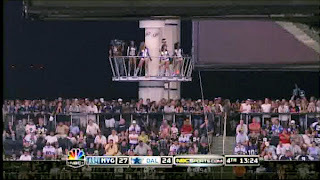 There are “cage dancers” in the end zones. 20-inch pizzas at the new stadium will cost $60..
And the corporate suites will range from only $100,000 to $500,000 per year. But, not everything, it seems, is bigger in Texas. While the Cowboys unveiled their new Jerry Jones Shrine, the Houston Texans quietly shrunk the size of their “souvenir” beer cups from 24 ounces to 20 ounces, while keeping the price the same -- over $7! 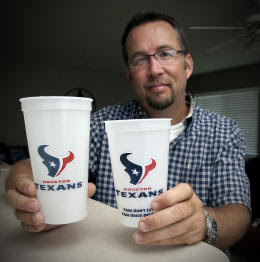 Bob Levey : For The Chronicle Houston Texans fan Scott LeBlanc shows the difference between last season's beer cup and this season's new serving size. The Texans would never have tried that trick in London. For one thing, the football hooligans would have destroyed the stadium (Sorry, Sir Dayvd. That's just American perception). For another, the team would be paying a hefty fine to the government. Beer expert Travis Poling of New Braunfels, co-author of Beers Across Texas: A Guide to the Brews and Brewmasters of the Lone Star State, which will hit bookstores soon, says size matters in the British Isles. When it comes to beer, ale and stout, shrinkage is illegal. A pint means a pint: The glass needs to be big enough to fit a full pint of brew with a couple of fingers left over for the head. If the Texans knew their sports history, they'd know Americans are sensitive to alcoholic shrinkage as well. A decade ago, then-Philadelphia Daily News reporter Don Russell, who wrote a column called “Joe Sixpack,” discovered a 2-ounce deficit at Veterans Stadium. His coverage led to a City Council investigation and a rapid retreat at the stadium. It also led to a standing ovation by a couple of thousand nearby fans when someone spotted him at a game. The football Texans aren't alone. About a year and a half ago distributors raised their prices to bars and restaurants. Many changed their glassware from pint (16-ounce) glasses to 14-ounce glasses. Some of the glasses look the same, but have thicker bottoms. At the San Antonio airport the price is now $10 for a 20-ounce beer. Its the modern way...you don't raise the price you shrink the product. What was that remark about REAL FOOTBALL??? American Football?? errr remind me again how many times the ball ( if you asked someone to draw a ball they would draw a circle but i'll let that one pass ) actually comes in contact with the foot. so again...In a game; Foot kicking Ball...How many times ???. whats that you say??? 3 to five times in a 3 hour match the rest of the time they use their hands??? Sir D, you miss the point...it's how many times the foot kicks your balls in the scrum! I liken the wearing of pads like reconstruction of a stock car for racing. It means you move faster with more violent collisions that you hopefully walk away from. Not discounting the physicality of your "football", just a different mind set. I miss the Friday night lights and the fading crowd noise taken over by my own breath and heart beating and the sound of feet pounding behind me trying to catch "Sticky Fingers Wells" as I run in another 30 yard pass play for a touch down! 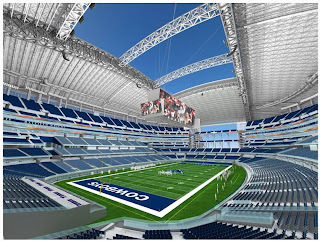 The Dallas stadium in impressive. I drove by the construction site, which was impressive enough the day I had my car wreck in Texas. Everything is bigger in Texas, but I had to laugh when the announcers where amazed about 100,000 plus fans. There are many venues that have that many attending. They regularly pack 110,000 in the Horseshoe at Ohio State football. Sir Bowie...can you spell ROAD TRIP! I know some great brew pubs in Dallas! I love football, too. The grace and beauty of the game juxtaposed against the sheer power is intoxicating. I'll watch it on TV, with a reasonably priced six-pack and a reasonably priced pizza, thanks. Lady T., a former Aggie and up-close witness to Texas (college) football at it's finest who knows that sometimes the eleventh man is a woman.